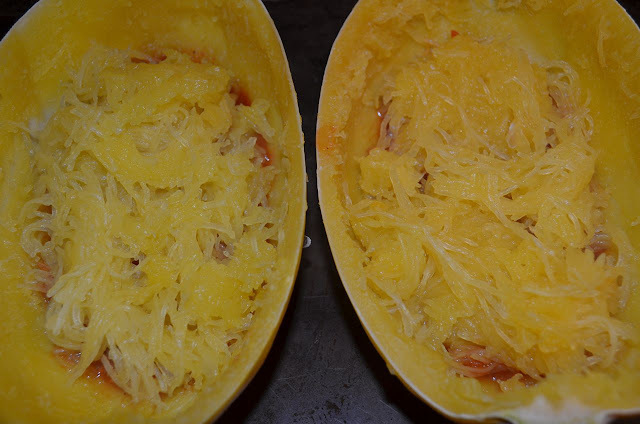 3000 miles north & back: Spaghetti squash spaghetti. 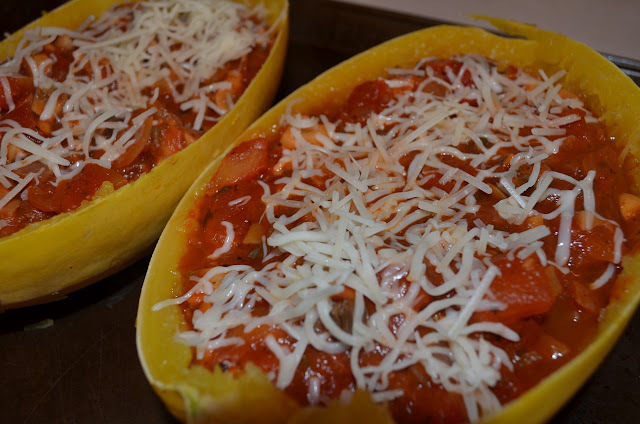 I have been wanting to make spaghetti squash for quite some time. I saw it used on the food network's "Chopped" just a few days ago and ever since, I've thought about using it in a recipe. 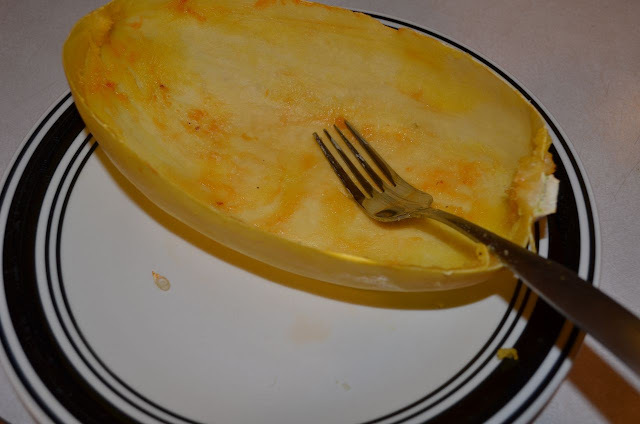 My mom used to make spaghetti squash when I was young but I remember being so disappointed that there weren't real noodles in the spaghetti that I never really enjoyed the vegetable. 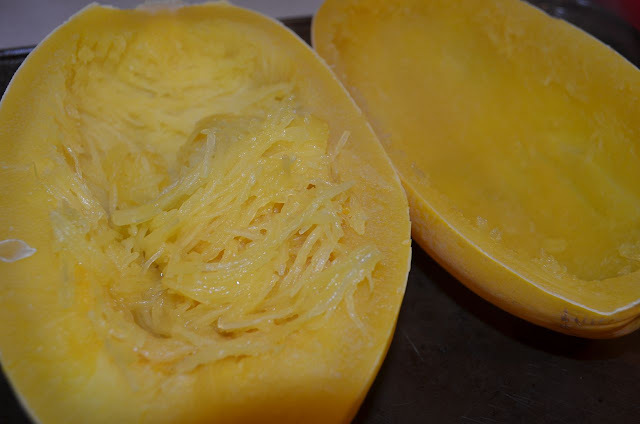 I gave spaghetti squash a try and was very pleased with the result. Matt was too, although at first he was disappointed there was no meat in the sauce (he is a meat guy). Once he got passed that (and added more and more cheese to his helping) he was satisfied as well. 1. Cut spaghetti squash down the middle, lengthwise. (Don't be intimidated...just do it. Slice it. You can do it.) Remove seeds and pulp from center (the seeds can be roasted just like pumpkin seeds...). 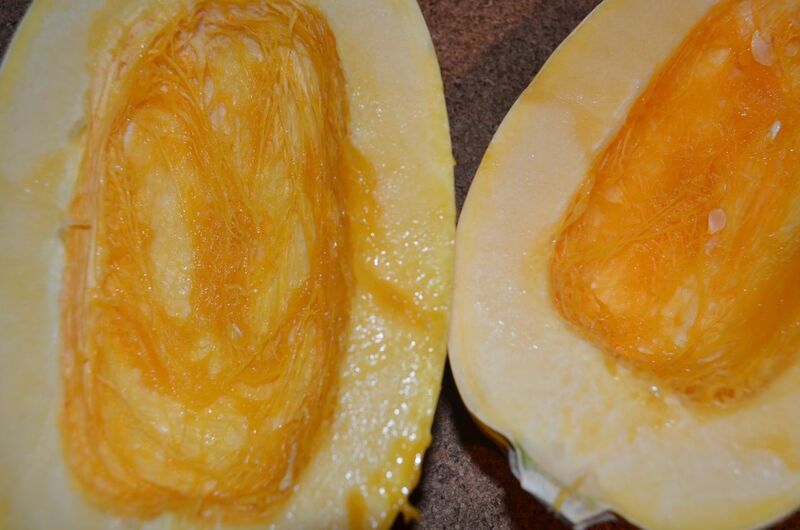 Bring enough water to cover both halves of spaghetti squash to a boil. Place spaghetti squash in boiling water skin side up (tongs work great). Boil squash for 20 minutes. Preheat oven to 375 degrees. 2. While spaghetti squash is cooking, make spaghetti sauce. Heat 1 Tbs olive oil and garlic in sate pan on medium heat. Add diced onion. Cook onion until translucent, about 5 minutes. Add spices. 3. 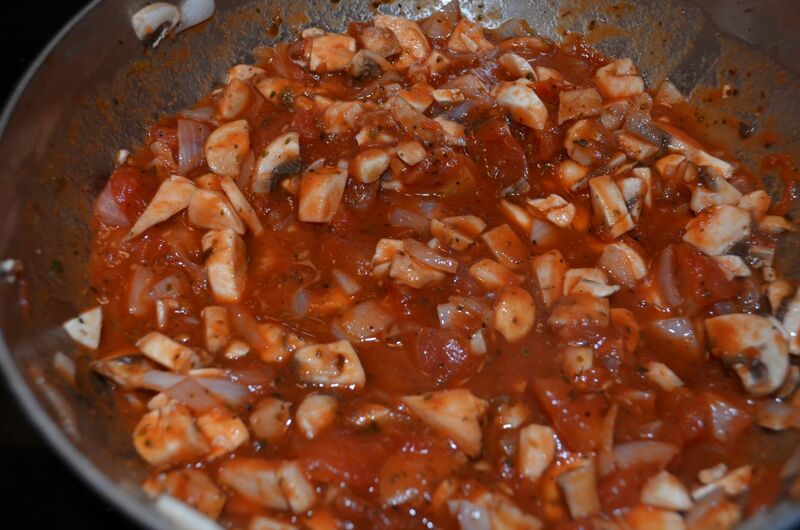 Add can of diced tomatoes and can of tomato sauce to onion and garlic mixture. Add half can of water. Cook until incorporated. Add mushrooms. Put lid on sate pan and simmer until ready to prepare. 4. Remove spaghetti squash from water with tongs. Separate and pull strands out of squash with a fork. 5. 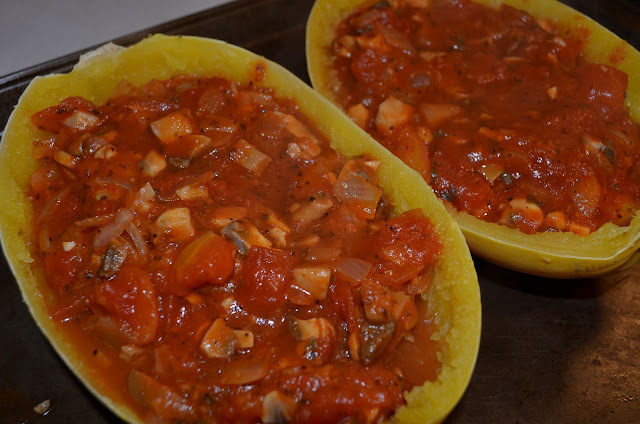 Place about 1/2 cup of sauce in empty squash shell. 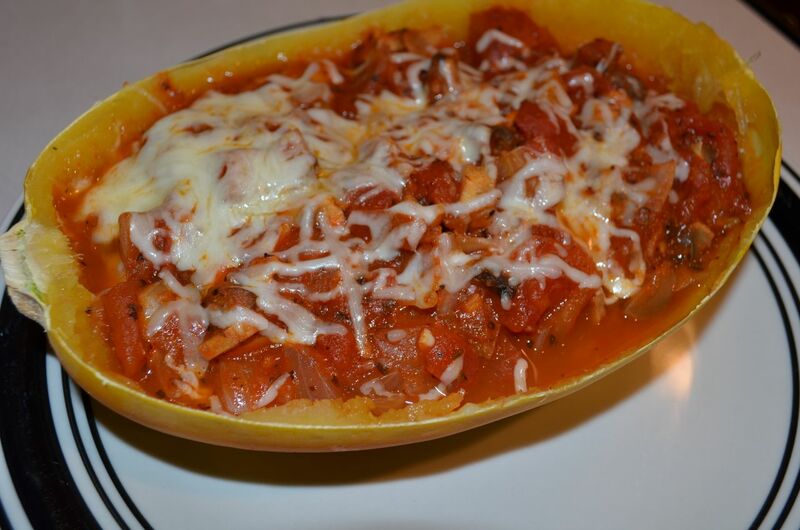 Layer spaghetti squash over sauce and layer another 1/2-1 cup of sauce on top, covering spaghetti squash. Sprinkle top with mozzarella and parmesan cheese. 6. Place finished shell on baking sheet. Bake for 10 minutes, or until cheese is completely melted. Remove from oven. Let sit for about 5 minutes, allowing juices to settle. Add additional cheese, as desired. I spent a few minutes staring at the spaghetti squash, slightly intimidated by the shell between the squash and me. Using a chefs knife, splitting the squash was not that difficult. 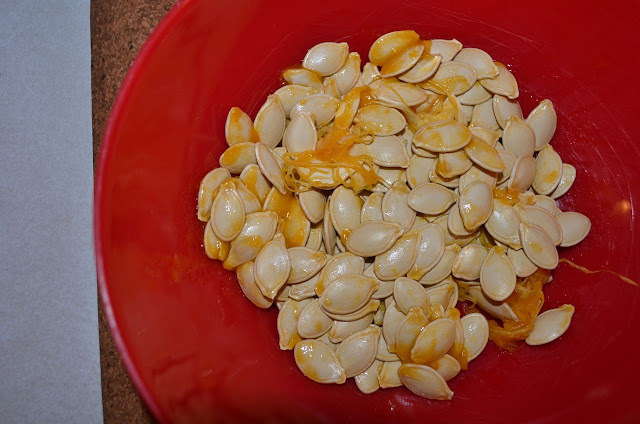 Once the seeds and pulp are have been removed, you will have formed a nice pocket that speeds up the boiling process. 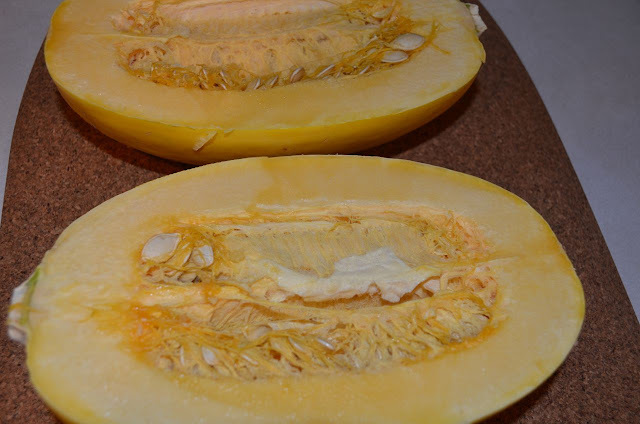 You can boil the squash whole or with the seeds, but splitting the squash in half and removing the seeds, speeds up the boiling process. I put the seeds aside...saving them for another time...and perhaps another blog post. While waiting for the squash to finish boiling is a perfect time to cook the tomato sauce. I used a meatless version but your favorite spaghetti sauce will work just fine. 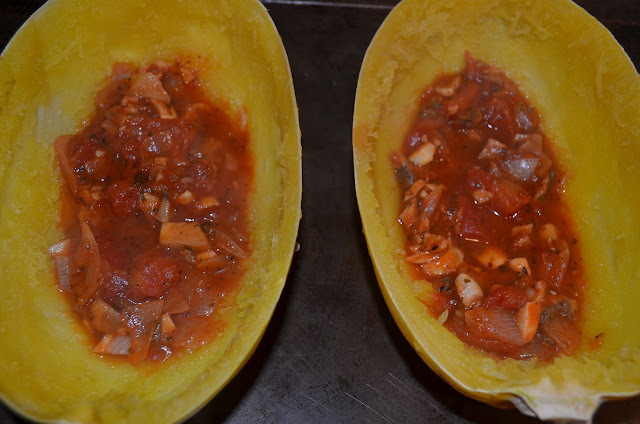 The mushrooms were a perfect compliment to the texture of the spaghetti squash. 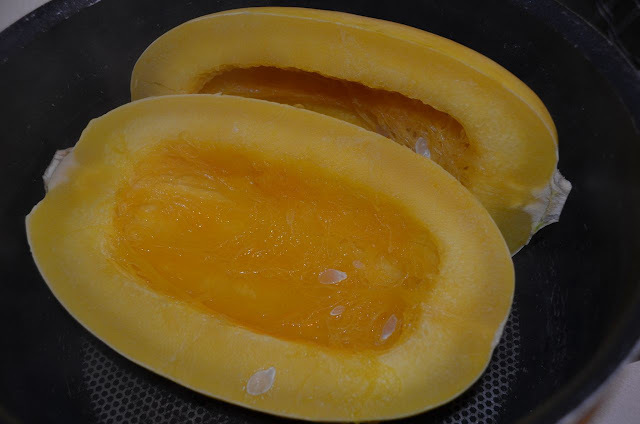 Once the squash has been boiled and removed from the water, the squash will look much more translucent than prior to boiling. Removing the squash from the shell was really quite fun. With a fork, the strands of spaghetti will just pull right off the shell. Continue pulling as much spaghetti from the shell as desired. I had plenty of left over spaghetti. It reheats perfectly. ...and a final layer of sauce. Sprinkle the top of the sauce with cheese...bake...and EAT! I scraped my shell clean...literally.